The United Methodist Women Program Advisory Group met March 28-30 at Scarritt Bennett Center to worship and work together for women, children and youth. Harriett Jane Olson at the Program Advisory Group meeting in March 2019. The United Methodist Women Program Advisory Group met March 28-30 at Scarritt Bennett Center in Nashville, Tennessee. Climate justice was the theme as the 90-member group gathered to worship and work together to ensure women, children and youth are a priority for the church. Those congregated heard reports from National President Shannon Priddy, General Secretary Harriett Jane Olson and United Methodist Women Treasurer Martha Knight and from the Legacy Fund and Reading Program committees and the deaconess and home missioner community. Attendees also participated in speaker coaching, a joint workshop on ending institutional racism and educational sessions on United Methodist Women social justice priority climate justice. As part of United Methodist Women’s Just Energy for All campaign, before the start of the gathering United Methodist Women representatives joined representatives from Tennessee Interfaith Power and Light to deliver a letter to local Ford dealership Wyatt Johnson Ford in Nashville and call on the car company and its dealerships to honor clean car emissions standards. You can read the story here. Program advisory group member Mary T. Nelson also led attendees in Native American pottery making before the opening plenary. Nashville Area Bishop William McAlilly joined United Methodist Women for the weekend’s opening worship. Preaching on Mark 10:46-52 he spoke of the people in his life who have helped him see with the eyes of Jesus. Olson explained that there’s a spectrum of opinion across the church and within United Methodist Women about the decisions made in St. Louis and the church’s next steps. Program advisory group members also discussed the ways women can lead in the church, including serving as and supporting General Conference delegates. Working groups also discussed United Methodist Women legislation to be brought to the 2020 General Conference in Minneapolis. In her Saturday morning address, Priddy told program advisory group members that now is the time to invite women into United Methodist Women. Mentorship, faith and courage to seek and try new ideas are key to growing the organization and thus to growing the mission possible for women, children and youth, Priddy shared. New members help the organization grow, but the organization also helps members grow. But it all starts with inviting women to join. Knight shared that 26 United Methodist Women conferences met or exceeded their Pledge to Mission in 2018, up from 2017. Total Mission Giving for 2018 was $11.4 million. 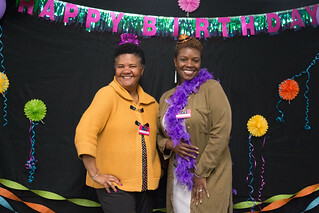 The weekend also included a celebration of United Methodist Women’s 150th anniversary, a milestone reached on March 23, 2019. She challenged attendees to learn from predecessors’ practices of prayer and risk-taking and from their persistence even through internal debates to show up on the side of justice. She also challenged program advisory group members to look to United Methodist Women’s Purpose in this time of transformation in the church. “With sisters around the world we are praying for what comes next as we look ahead to General Conference in 2020. My question for us today is, can we take this time as an opportunity to become more truly ourselves?” she said. “In many ways, in the strategic plan, we find some guides in this direction, and so also do we find this in the commitment expressed by our board of directors to the important and countercultural work of staying together, focused on mission with women, children and youth. It's a time for women to be alert to the changes happening in the denomination and for United Methodist Women members to live into their roles as faith leaders across the church, Olson explained, working for the good of the whole church and building a strong platform for United Methodist Women into the future.